DOMINANCE is the word that describes the NEW BOSS Semi Upright whitetail Series. This Semi Upright whitetail series offers a beautiful offset shoulder that creates ACTION with a highly MUSCULAR anatomy! 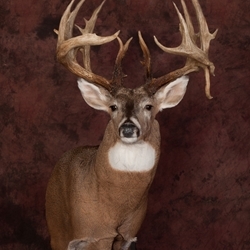 Each BOSS Semi Upright whitetail presents your mount in an attitude that says “I’m the BOSS”!